The toys children are playing with can have a fundamental role in shaping their futures. Research has shown that the first three years of a child’s life are crucial when it comes to early brain development. This is because the brains basic architecture is laid out during this time, something that is greatly influenced by the surrounding environment and early experiences. Furthermore, how a child develops learning and social skills is directly related to this early period. You can find out more about your child’s early brain development here. Parents often underestimate the role that toys play in promoting physical, social and cognitive development. 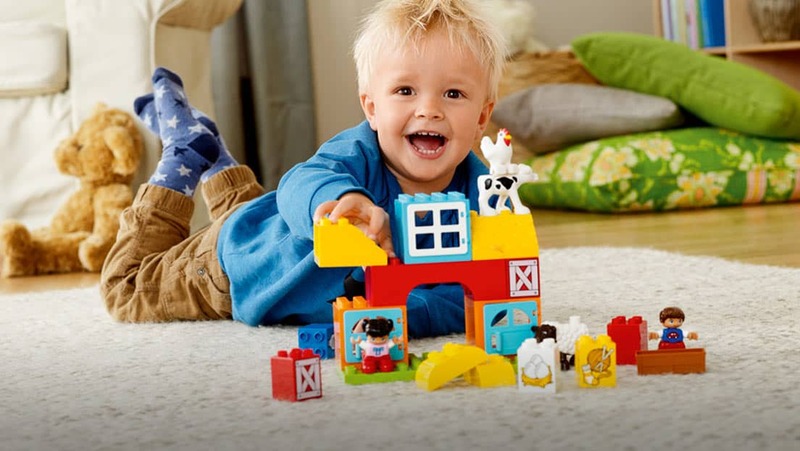 Toys help build critical thinking, decision making and problem solving skills, as well as encouraging the development of gross and fine motor skills. They provide mental stimulation during those first three years which, along with love and nurture, is the key to healthy brain growth. However, with so many toys on the market these days it can be hard to know what is best for your child. Luckily we specialize in identifying toys for building Science, Technology, Engineering & Math (STEM) skills in kids of all ages. So read on for our recommendation of the top 5 STEM toys for toddlers to learn engineering, computing and science. Related: See our Top 10 Best STEM Toys for 2018 here. Best for Learning: Fine Motor Skills, Problem Solving, Math. Duplo building blocks from Lego are a great engineering toy for toddlers that can develop creativity and fine motor skills. Through trial and error kids learn how to manipulate the bricks and build what their imagination tells them too. This is great for promoting problem solving skills and is a fantastic early engineering toy for toddlers. What’s more, the bricks are colorful and easy to fit together which helps to keep kids engaged. 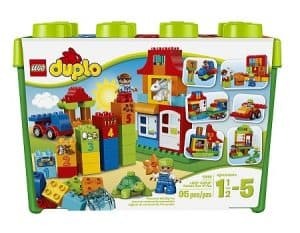 Watch your child’s creativity flourish with this great value, 95 brick set. We chose this particular set because it features numbered bricks which can be matched with the corresponding picture bricks. So it’s also a fun way to learn basic counting. Lego have been producing classic learning toys since the 1930s, and they are still doing that to this day! This set is a great foundation for more complex engineering toys. 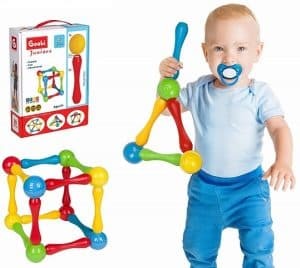 The Goobi Juniors 20 piece set is a great magnetic building toy for toddlers for developing creativity, motor skills and basic engineering. The pieces are large, colorful and simple, so again well designed for smaller hands! Magnets on the end of the rods attach to the balls, allowing toddlers to build endless different configurations of 3D structures. The magnets are strong enough to hold their creations together, but not too strong to make it difficult to take it apart and build something new. Overall, this magnetic building set is an affordable way to keep your little one busy, whilst helping develop some essential skills. Additionally, it’s also great for laying the foundations for toys like K’Nex. Best for Learning: Cause & Effect, Sensory Perception. When it came to sorting through deciding on the best educational toys for toddlers for 2018, we had to include an offering from VTech. The VTech learning laptop for toddlers and babies is designed to introduce kids to computers from an early age. With a light up screen and chunky keys, it resembles the shape and basic functionality of the real thing, but is super easy to use and perfect for tiny hands. Lights and sounds respond to your little ones actions when pressing the keys which is great for developing sensory perception. It’s also a good educational toy for toddlers to learn about cause and effect. 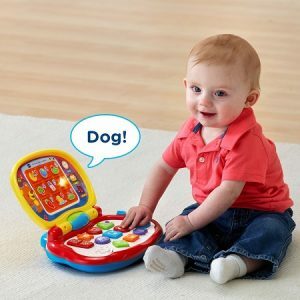 With over 115 songs, sounds and fun phrases, the Brilliant Baby Laptop is great value for money. Some parents complain that the songs get annoying, so do be aware of this before you buy! Best for Learning: Computer Literacy, Co-ordination. 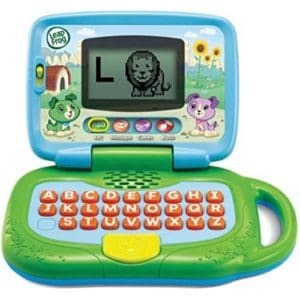 If your kid gets along well with the VTech Laptop, or you are looking for something more advanced, the LeapTop laptop for toddlers is a great step up. With a more complex alphabetical keyboard it’s a great way to learn letters and spelling. This will also get your toddler even more accustomed to the real thing. The LeapTop features 4 interactive learning modes including music, ABCs and games. Furthermore, bright colors, animals and animations help keep kids engaged. This toy is great for developing basic computer skills, as well as the alphabet and simple vocabulary. It’s an all round good learning aid and has certainly earned our recommendation as one of the best computing toys for toddlers this year. Best for Learning: Cause & Effect, Basic Engineering. 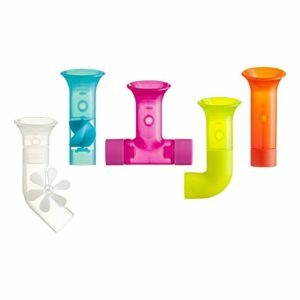 This innovative little Boon Bath Pipes set is a great little engineering toy for toddlers to develop a bunch of skills. The idea is simple, different shaped pipes stick to the tub with suction cups whilst your little one pours water through them. Some of the pipes also have watermills in them which are great for learning about cause and effect. Your toddler can explore different combinations and work out how to make water flow between them. Developing problem solving skills like this can really help your kid to start to understand the basics of engineering. As such, this is a great engineering toy for toddlers. There is also a great extension available called Boon Cogs, which is a similar idea but with cogs that stick to the tub instead of pipes! Our list of the best educational toddlers toys & kits would not provide a rounded curriculum for your little one without a science based toy. However, finding science toys for toddlers can be a hard task because they are often to complex or fiddly. That said, whilst not strictly a science toy, the B. Dr. 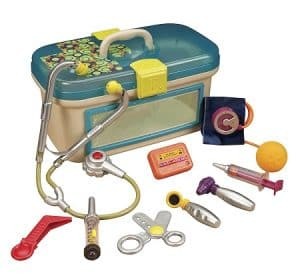 Doctor play set is a great way to learn some basic scientific principles through play. The set includes a safe syringe, thermometer and forceps, as well as various other medical replicas. Therefore, playing with this can help get your toddler familiar with basic scientific equipment, as well as developing hand-eye coordination and fine motor skills. It also has the added benefit of helping to alleviate anxiety over doctor visits! The toys featured on this list were all picked because they help build the foundations for more complex STEM concepts. However, if you think your toddler is already too advanced for the toys here, see our list for preschoolers. Conversely, take a step back with these educational toys for infants.